Blackmagic MultiView 4 HD are the world’s first native Ultra HD multi viewers that let you monitor completely independent SDI video sources on a single HD or Ultra HD display! With full frame re‑synchronization on every input, you can monitor any combination of SD, HD and Ultra HD formats and frame rates all at the same time, on the same display. When used with an Ultra HD television, the quad split view gives you four full resolution 1080 HD monitors on a single screen! You also get on screen audio meters, custom view labels and much more! 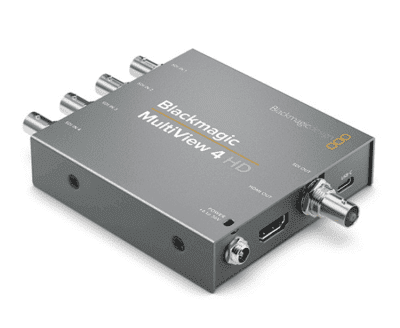 The new Blackmagic MultiView 4 HD model is a low cost multi viewer that lets you simultaneously monitor 4 different SDI video sources on a single display! Each view is a completely independent video monitor with overlays that you can turn on and off such as custom labels, audio meters and more. Full frame re-synchronization on each input lets you monitor any combination of video signals, even if they are different frame rates. The multi rate 3G-SDI connections are compatible with all existing SD and HD equipment and formats up to 1080p60, including Level A and B devices. Plus, you get both 3G-SDI and HDMI outputs so you can use traditional SDI displays or even low cost big screen televisions! Blackmagic MultiView 4 has four independent 6G‑SDI inputs that work with all SD, HD and Ultra HD formats up to 2160p30. The included Ethernet remote control software lets you turn on audio meters, select audio to output, and create custom labels. MultiView 4 displays your sources in a standard 2×2 grid. You can also add a Teranex Mini Smart Panel for full front panel control and rack mount it using the optional Teranex Mini Rack Shelf! Blackmagic MultiView 4 HD monitoring is perfect for massive control rooms with lots of incoming feeds, for live multi camera production or for use on location and in tight spaces that don’t have room for multiple monitors. With Blackmagic MultiViews you don’t need to connect multiple monitors, dozens of cables or run extra power to see all of your video sources! Simply plug your cameras, decks, switchers and routers into the SDI connections to see everything with amazing clarity and detail on a single HD or Ultra HD monitor! SDI Video Inputs 4 x 10-bit SD-SDI and HD-SDI. SDI Video Outputs 1 x HD-SDI. SDI Video Multi View Outputs 1 x 10-bit HD-SDI. SDI Reclocking On all SDI outputs, auto switching between standard definition or high definition. Multi Rate Support Auto detection of SD or HD. SDI Compliance SMPTE 259M, SMPTE 292M, SMPTE 296M, SMPTE 310M, SMPTE 425M-B, ITU-R BT.656 and ITU-R BT.601. Audio Meters Each view, VU standard. SDI Color Space YUV or RGB for inputs, YUV for outputs. SDI Auto Switching Automatically selects between SD-SDI and HD-SDI on each input so that each input can be running a different television standard. Software Control MultiView software included free for Windows™ and Mac OS X™. Power Fail Protection MultiView 4 HD settings preserved and restored instantly at power on.